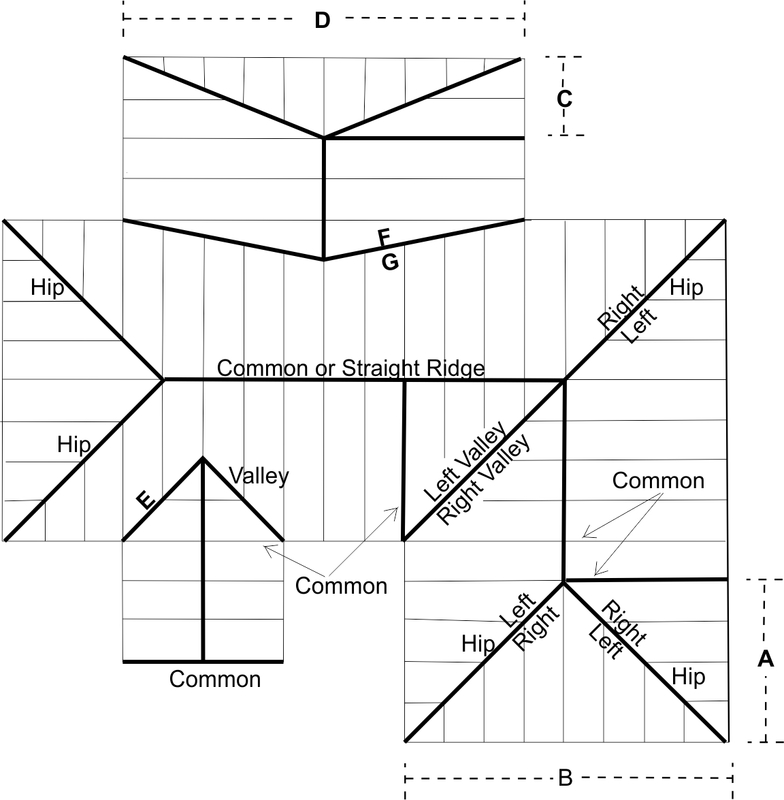 Order equal amounts of Left and Right for each application of both Hip and Valley, using your COMMON RAFTER PITCH as an ordering reference (calculations are made from that). This must be accurate. No guessing! Consult your plan, or talk to your architect or builder. Equal Hip is when A is half B (most common). If smaller roofs cut into larger roofs, nothing changes - provided both pitches are the same, as in E.
If this is not the case, as in C and D, OR where there is a junction of two different roof pitches, as in F and G, speak to your architect or builder, or contact us. Left and Right are determined as viewed from ground facing the Hip or Valley. STANDARD CORRO RIDGESEAL is also available as a Hip Flashing (in Zincalume and Surfmist only). Order Code Standard Ridgeseal L (?) and R (?). All Hip and Valley profiles have a wave shape (unlike common or straight ridgeseal); that is, the front slope 1 is steeper than the back slope 2. This SHAPE and DISTANCE between profiles changes with roof pitch. IF THE FLASH DOESN�T FIT SNUGLY into the roof, you have it on the wrong side (easily mistaken!). WHY NOT USE A FIBROUS OR FOAM SEAL? Alternate fibrous or foam seals have a damming effect and suffer from moisture retention due to condensation, leading to poultice corrosion of roof sheet. WHY DON�T I JUST SCRIBE IT? Valleys can�t be scribed under the roof sheet. Colorbond roof sheeting can be damaged with random hand cut flashings, particularly when hit with a hammer to make it conform to the roof profile from an imperfect shape. This damage may void sheet warranty. Precision profile cut metal flashings meet the BAL for Bushfire Attack, and are quickly installed. Where a metal valley support tray with incorporated battens is used (varies between makers) a different configuration of valley flash may be required. In this case contact us. All CAMPBELL products carry IP protection in the form of Patent and/or Registered Design and/or Trade Mark.